For most of its history, the study of folklore has been seen as the last minute gathering of 'vestiges', 'survivals' or 'fragments' of a formerly universal culture. John Aubrey entitled his 1686-7 collection, Remaines of Gentilisme and Judaism; Thomas Percy published what he saw as Reliques of Ancient English Poetry in 1765 and in his Preface referred 'select remains of our ancient English Bards and Minstrels'; 'Survivals in Culture' theory dominated Folklore scholarship for at least a hundred years and still has considerable currency; whilst Cecil Sharp defined folksong as that found among the 'remnants of the peasantry' - a perspective not merely echoed but reinforced in arguments put forward by Keith Chandler in his recent review of The Birds Upon the Tree (Musical Traditions MTCD333). Whether we notice it or not, underlying much of our discussion is a vista of disconnected ruins in a lost landscape of Folk culture, fitfully glimpsed in broken-down remnants of a once great tradition of song. 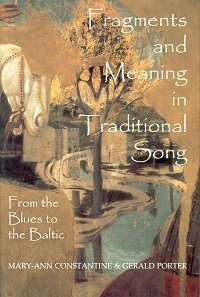 Fragments and Meaning in Traditional Song takes this venerable aspect of Folklore Study's mental furniture and considers its implications across a range of fields. Drawing on material as eclectic as blues reinterpreted on Nirvana Unplugged, religious elements in nineteenth-century Breton ballads, literary texts by Herder (epically romantic) and D H Lawrence (grumpily querulous), topics whirl through its pages at a cracking pace. There are excursions into the 'death' of Bobby Ewing in Dallas, proverbs, voodoo, cannibalism and musical traditions from Austrian yodelling to Finnish eviction songs, the Child cannon to popular songs in the First War and travellers' carols. It's a work of ambition and sweeping scope. Perhaps unsurprisingly given sheer scale of topics referred to, few are explored in detail - and this is particularly marked in the case of traditional songs. Here the authors quote, and seem to share the view of the American ballad scholar, Tristram Coffin, who concluded his survey of variation in the British traditional ballad with the cautionary note - 'any attempt to go beyond generalisations is bound to raise trouble'. As a result, Fragments and Meaning in Traditional Song offers a high level overview, which makes only brief and occasional forays into specific examples. Since the implied audience is not the same thing as the actual listeners present, this will not be the same for each person. The 'folk community', with its shared values and attitudes, is a model which we now know to be a radical simplification. No matter how long the song may be, there can be no perfect fit between performative and interpretative codes. We must always work to make sense of any message, and that sense will depend not only on the degree of our exclusion or inclusion from a hypothetical group of qualified listeners, but on other factors, above all gender, race and class. So whether Bill Porter looked at his audience in 1965 and decided they knew the song so well they didn't need to hear it all, if he thought they seemed bored and so cut it short; if he'd forgotten the rest or made a conscious artistic decision that the song sounded better if he sang it in that way is not investigated in his or any other singer's case. Although they refer to the 'logocentric view of human behaviour which regards songs primarily as texts', there's an obvious puzzlement in the authors' discovery that 'When their views are consulted, singers very rarely consider their songs to be short'. (p.128) In this volume, however, singers are not usually troubled to put forward views - considered or otherwise - and the potential for interpretation by an 'implied audience', which the authors helpfully suggest elsewhere might include a Canadian lesbian or an African American, remains open to create ever more pages of wordy supposition. And what about 'meaning'? Do singers or audience only see meaning in a song through interpreting its text? For every song that has lines, verses or a whole story that is deeply meaningful to the listener, I'd suggest there is another one for which the meaning is evocative - reminding the singer or hearer of a person or an event that has no literal connection with the text. Does the meaning of Good King Wenceslas ever rely on an awareness of the history of the monarchy and class relations in Bohemia, or is it more usually associated with personal memories of times it was heard at Christmas or who sang it? A member of the audience sitting next to me at a concert in Sidmouth was moved to tears by hearing Roses of Picardy played - it wasn't the song's story of a foreign love in wartime that moved her, but the fact that the song had been her grandfather's favourite and brought back intense memories of him. Despite its reference to the differing responses 'actual listeners', the book's only examples refer to ways in which the language of texts might be understood. He made the sun clear, and the moon, like the water on dry land. ... contains a good enough selection of key words and phrases to be recognisably a carol and earn a penny. It doesn't need to make 'sense' in order to convey its meaning or to function in performance. There is also a larger question here that is not addressed. In an earlier section of the book (p.53), a fine - and perfectly logical - version of Raking the Hay as sung by 'Phoebe Smith, the English traveller' is quoted without any suggestion of the paradox it creates for this discussion. If Travellers culture is supportive of the development of 'disrupted texts' as the authors suggest, how is this to be equated with performances by singers like Phoebe Smith, Betsy and Charlotte Renals and Sophie Legg (as for example on Catch me if you Can: Songs from Cornish Travellers, Veteran VT 129CD), or a host of Scottish voices offering narratives with coherent storylines? So what does Fragments and Meaning in Traditional Song offer to researchers working on traditions of singing and the contribution singers can make to our understanding of them? Our esteemed Editor observes (earnest pursuers of scholarship, may need to avert their gaze here), that the presence of strong drink in contexts of collection and performance is well worth exploring as a source of fragmentary songs. It's also the case that ballad performance may (occasionally) be less concerned with the exact reproduction of a traditionary text and more about enjoying the act of singing and having a good time. For all its breadth of literary sources and consideration of a world of traditions, sadly, it's an opportunity missed.